Defender of the poor and marginalized, we seek Your guidance. the cry of the widows. Let us feed the orphans. Let us denounce injustice by the powerful. May we demand drugs for the sick. May we demand care for the abandoned. May we denounce wastefulness by the affluent. In Your mercy forgive our condemnation of people living with HIV/AIDS. Forgive us when we deal lightly with the wounds of Your people. Forgive the times when we have offered artificial solutions. Empower us to tackle corrupt systems. Make us agents of Your transformation. World AIDS Day is December 1 each year. The prayer was taken (and then modified to add inclusive language) from Church World Service. Global Ministries has a special World AIDS Day web site with all kinds of valuable information. My own prayer this World AIDS Day goes out for my friend Gene Ediger. Erik Brockley was a messed up little kitten when he was abandoned in front of a pet store back in 1991 in Beaverton, Oregon. My mother rescued him and he came to live with me. Erik Brockley was named after Erik Huntzicker and Jani Brockley, two close friends of mine. Erik the human was moving off to attend medical school in Minnesota and Jani was heading to graduate school in New Jersey . Realizing that I would miss them terribly I named the kitten after them to help compensate. Animals are people too in my family and Erik was as close to human as you a can get. Each night he slept with Liz and me (most of the time on the top of my head). Tonight he unexpectedly passed away. The picture above was taken of Erik this summer just after the twins were born. In this second picture, which was taken last week, Erik is seen taking a nap with our other cat Freedom. We’re all going to miss him. You can find a few more pictures by clicking here. The ad, part of the denomination's new, broad identity campaign set to begin airing nationwide on Dec. 1, states that -- like Jesus -- the United Church of Christ (UCC) seeks to welcome all people, regardless of ability, age, race, economic circumstance or sexual orientation. Negotiations between network officials and the church's representatives broke down today (Nov. 30), the day before the ad campaign begins airing nationwide on a combination of broadcast and cable networks. The ad has been accepted and will air on a number of networks, including ABC Family, AMC, BET, Discovery, Fox, Hallmark, History, [email protected], TBS, TNT, Travel and TV Land, among others. The debut 30-second commercial features two muscle-bound "bouncers" standing guard outside a symbolic, picturesque church and selecting which persons are permitted to attend Sunday services. Written text interrupts the scene, announcing, "Jesus didn't turn people away. Neither do we." A narrator then proclaims the United Church of Christ's commitment to Jesus' extravagant welcome: "No matter who you are, or where you are on life's journey, you are welcome here." The ad can be viewed online at www.stillspeaking.com. A poll came out this year that showed that 64% of "evangelical, born again Christians" would support a Constitutional amendment to establish Christianity as the official religion of the United States. 32% of the general population would support such a move. Something is deeply wrong in America these days. Thank goodness there are groups like Americans United for Separation of Church and State (headed by UCC minister Barry Lynn) working to protect our freedoms. Visit the Americans United web site and learn how you can help protect the Consitution. MR. RUSSERT: The Sojourners newspaper took out an ad--the Sojourners magazine took a newspaper ad out, Reverend Wallis, in which this was the headline. "God Is Not a Republican or a Democrat. ...leaders of the Religious Right mistakenly claim that Mod has taken a side in this election and that Christians should only vote for George W. Bush. We believe claims of divine appointment for the President, uncritical affirmation of his policies, and assertions that all Christians must vote for his re- election constitute bad theology and dangerous religion." REV. JIM WALLIS: Well, Christians voted both ways in this election. God is not a Republican or a Democrat. That should be obvious. The values question is critical. The question is how narrowly or how broadly we define values. So we say that poverty is a religious and moral value. So is the environment. So is the war in Iraq. These are moral value that require a lot of discussion. I welcome the moral-values conversation. I really do. It's the soul of our politics, the compass of our public life. But how narrowly or how broadly we define the values is the question. In this election, there were competing values, so a lot of Christians voted both ways because we wanted to vote all of our values, not just one or two. I think the Democrats are often uncomfortable talking about faith values, when it's even about their agenda. The Republicans want to narrow, though, or restrict values to one or two issues--important ones, but one or two. I think the Democrats have to recover their heart and soul; Republicans need a broader and deeper agenda about values. Wallis is one of those rare religious activists who have been known to be critical of both Republicans and Democrats. He is a pro-life advocate who voted for John Kerry in the last election. He also lead protests against Bill Clinton’s welfare policies in the 1990s and was critical of the former president’s personal indiscretions. Falwell’s comments sounded like old and tired rhetoric from a Republican Party political operative. DR. FALWELL: Jim, let me ask you a question. Did you vote for John Kerry? REV. WALLIS: I did vote for John Kerry. DR. FALWELL: Now, he is pro-choice. How can you as an ordained minister--you are an ordained minister, right? DR. FALWELL: How could you vote for some--I wouldn't vote for my mother if she were pro-choice. REV. WALLIS: Yeah. You endorsing George Bush. That's fine. But you also called--you ordained him. You said all Christians could only vote for him. That's ridiculous. There are Christians who voted for deep reasons of faith for both candidates. One of the problems with contemporary religious dialog is that it gets reduced to these brief exchanges in the national media. Those on the religious right are masters of this type of forum. Progressive religious leaders have shied away from both the media and the kind of grassroots organizing done so effectively by Falwell and company. I’ve said it before and I’ll say it again: those of us who are religious progressives need to be more engaged with issues of public concern. We need to creatively force the media into hearing our side of the debate. Our churches and leaders need to be better organized to promote an inclusive and progressive theological message. That is not to say that we should imitate the Religious Right. They preach division and that is a perversion of the Christian faith. Our model for organizing should be Jesus who always spoke of an open table where all were invited to partake in the justice of God’s Kingdom. Wallis did a sound job of articulating that vision this Sunday. My sisters, Heather Currie Medders and Jennifer L. Currie, have started their own business selling charms. Now amberbambini charms and gifts is also open for business on the web. Go visit their site and get some high quality gifts from a small family owned outfit. Below is the sermon I delivered this morning at St. John United Church of Christ on Matthew 24:36-44. Then two will be in the field; one will be taken and one will be left. Two women will be grinding meal together; one will be taken and one will be left. Keep awake therefore, for you do not know on what day your Lord is coming. But understand this: if the owner of the house had known in what part of the night the thief was coming, he would have stayed awake and would not have let his house be broken into. Therefore you also must be ready, for the Son of Man is coming at an unexpected hour. Here we are. The unexpected hour is at hand. This is the first Sunday of Advent. We prepare to celebrate the coming of our Savior over two thousand years ago, to remember his life and the Word of God, and to prepare ourselves as faithful Christians for the different missions God has set upon us. This is the start of a special time. Thanksgiving celebrations have just concluded and now we have a month of special holiday worship services, concerts, family gatherings, parties, and children’s pageants to look forward to. Our consumer culture tries to drown out the real meaning of this time. For many it is simply a season of buying and receiving. Commercials on television focus our attention on the more material aspects of this season. The spiritual message of the season is hard to get through. In a world so torn apart by war and violence we need to always be reminded that our God is a living God that still speaks to us. God still wants for us the things God sent Jesus to preach: a world without war, a world without discrimination, a world where we put the needs of others ahead of our own self-interest. In the midst of all those commercials selling the latest must have toy will be another message this Advent season. The United Church of Christ will launch our long awaited national "God is Still Speaking" advertising campaign on December 1. A new television commercial will air across the country promoting our denomination and local churches. This is the first national television advertising campaign undertaken by our denomination. Over 2,000 UCC congregations (out of 6,000) signed up for special training sessions in advance of the campaign. Many more churches have already signed-up to take part in the second run of ads that will be seen during Lent. St. John will be one of those congregations taking part in the second session of trainings. The spot is edgy and has an important theological message. Bouncers, like those seen at trendy nightclubs, are seen in the ad standing outside a church. As people try and enter for Sunday services the bouncers are deciding who gets into church and who doesn’t. The bouncers exclude anyone who doesn’t fit the definition of the “normal” Christian. Then the screen fades to the message "Jesus didn't turn anyone away and neither does the United Church of Christ." At the end of the commercial there is a group of diverse people standing together at the entrance of the church. It symbolizes the openness which our denomination strives for. Before committing to run this commercial it was test marketed in Springfield, Massachusetts; Harrisburg, Pennsylvania; Tampa Bay, Florida; and San Diego. There was a 27-percent increase in new people coming to UCC churches in those cities after the commercial aired. There are going to be some people who dislike the commercial. The sad fact is that there are plenty of Christians who do want to exclude people from church and from positions of leadership. Over the centuries many denominations have excluded women and African-Americans, for example, from being full participants in the life of the church. Our forebears in the UCC understood this mistake when in 1785 they ordained the first African-American minister and in 1853 ordained the first women pastor. God was still speaking to these early American church leaders and they were brave enough to answer. We are fortunate today to be part of a denomination that still hears God speaking and is willing to act on it. There are countless stories of how local UCC churches have acted on God’s call for us to act compassionately and with justice. World AIDS Day also falls on December 1st and it is appropriate to link this special day with the launch of our new advertising campaign. According to a report just released by the United Nations, “the total number of people living with the human immunodeficiency virus (HIV) rose in 2004 to reach its highest level ever: an estimated 39.4 million people are living with the virus. This figure includes the 4.9 million people who acquired HIV in 2004. The global AIDS epidemic killed 3.1 million people in the past year.” In many areas of the world, including the United States, women now account for 50% or more of new HIV infections. The people of Trinity United Church of Christ in Chicago have heard God speaking in the face of the global AIDS crisis and have decided to tackle the problem head-on by starting programs in their community to combat the spread of the disease. They work with local health agencies and non-profit groups to provide case management services for people living with AIDS, primary health care, mental health and substance abuse programs, and spiritually based support groups. While this important work occurs on a local level our national UCC offices, through the joint UCC-Disciples of Christ agency Global Ministries, works to provide relief to people living with HIV and AIDS on an international level. They support projects in Africa and China - doing there what Trinity UCC does in Chicago. Global Ministries and the UCC office of Justice Ministries also work together to help educate public officials about the dangers of the AIDS crisis and seek to develop partnerships between governments, churches, and non-profit agencies that seek to provide care and find a cure. Other churches in our denomination are hearing God speak about different but equally important issues. Genocide should be one of those issues being covered 24/7 in the media. Churches should be praying about it every Sunday and organizing relief efforts. Our politicians should be reaching a bi-partisan consensus to rally the world to intervene. Instead we ignore the genocide taking place in Darfur in the Sudan. Somewhere around 293,000 people have been killed so far. "The Sudanese Government, using Arab ‘Janjaweed’ militias, its air force, and organized starvation, is deliberately and systematically killing the black Sudanese of Darfur,” reports darfurgenocide.org. The United Church of Christ of Petaluma, California is working to address this crisis. Their fall forum focused on the genocide, local high school students are being invited to take part in an essay contest, and the church is asking people to donate money to Church World Service to help the victims of the crisis. Jesus preached a theology of the open table and called God’s people to be inclusive as we live out the Scriptural mandate to do justice, and to love kindness, and to walk humbly with our God (Micah 6:8 NRSV). As we’ve noted, many Christians seem to spend all their efforts trying to find ways to exclude people from the table. That is not the case with Northshore United Church of Christ in Woodinville, Washington outside of Seattle. The church offered to allow a homeless camp to move onto their property earlier this year. Nearby residents were fighting hard to keep the homeless out of their community. One resident, Stacy Meyer, told the media having those who are homeless in her neighborhood amounted to “terrorism” on the part the church. Being part of the United Church of Christ means that our local churches have an enormous amount of independence. We are not forced, as in some other denominations, to all agree on one theological vision over another. Some cities might have two UCC churches on the same street that look very different in how the conduct worship services and in what issues they hear God speaking to them about. That diversity makes us unique. The only draw back is that those differences allow us to sometimes forget we are part of a larger denominational body. A benefit of this advertising campaign will be to strengthen our denominational identity. St. John United Church of Christ in Manchester, Missouri is part of the same denomination that includes that church in Chicago working to fight AIDS, that church in California trying to raise a voice against genocide, and that church in Seattle working to help those who are homeless. This is also an opportunity for all of us to invite people to visit our church. It is estimated that 60% of the American population will see our commercial 4-5 times during the Advent season. There is no doubt that people will be talking about this spot. It is memorable and has already attracted press coverage before even airing. You can watch the commercial now by visiting the web site www.stillspeaking.com. All of us must be evangelists for the Gospel. Take advantage of the opportunity and ask your family and friends if they see the commercial and invite them here to see how God is still speaking to our congregation. Two thousand years ago people waited for their Savior to arrive. People are still waiting today. Let us lift up our voices this Advent and let people know that God has issued an invitation for all to sit at the table. The unexpected hour does not have to be faced alone. Let us make ready for the coming of the Lord together as a united church. The UCC’s Justice and Witness Ministries has joined with the National School Boards Association and 11 other organizations to publish a legal guide to help schools and students understand the rights of young persons and responsibilities of educators with regard to sexual orientation issues. "Dealing with Legal Matters Surrounding Students’ Sexual Orientation and Gender Identity" is a 16-page resource that chronicles legal issues surfacing in schools and the courts, including curriculum, dress codes, school events, harassment and gay-straight alliance groups. It is available online at nsba.org. NEW YORK, NY – The head of a global humanitarian and refugee assistance agency today decried the circumstances surrounding the November 3 death of Haitian asylum seeker Rev. Joseph Dantica, who died while in the custody of U.S. immigration officials. The 81-year-old Haitian minister and humanitarian, uncle of award-winning Haitian-American author Edwidge Danticat, died allegedly of pancreatitis after spending four days in Krome Detention Center, where he was placed by Department of Homeland Security (DHS) officials along with his son Maxo Dantica following their arrival in Miami. A frequent visitor to the U.S., the elderly Dantica held a valid U.S. visa. Following weekend memorial services for Rev. Dantica, Executive Director and CEO of Church World Service Rev. John L. McCullough said, "Joseph Dantica’s death was a deep and unconscionable tragedy that must not be in vain. The circumstances surrounding his death are outrageous and cannot be allowed to pass by as if they did not happen. "With a valid visa, even though Rev. Dantica had this time requested asylum, immigration authorities had discretionary authority to release him. To have denied an 81-year-old man needed medication on top of detention is appalling," said McCullough, "and sadly does nothing more but further damage the image that our country is already suffering in the world community." McCullough, an African American, said, "Maybe, just maybe, this is an event that will finally wake people and spur Congress to act fairly in its treatment of Haitian asylum seekers." Just before Thanksgiving—a time Americans give thanks for our freedoms—Congress was busy curtailing reproductive freedom. In a behind-the-scenes maneuver, the Republican leadership tucked a provision into the massive $388 billion appropriations bill that will enable health care companies, hospitals and insurance companies to ignore Roe v. Wade. The provision—which pro-choice advocates term the Federal Refusal Clause—will give the go-ahead to health-care entities to bypass state and local laws and regulations that make certain that women's access to reproductive health services includes access to abortion. The intention behind the Federal Refusal Clause is to further curtail already dwindling access to abortion services and even counseling that mentions abortion as a legal option. The provision does this by denying federal financing to government agencies that ''discriminate'' against health care providers who choose for any reason to disregard state mandates to offer abortion-related services. This is a vast expansion of the ''conscience clauses" already in place in 45 states, which appropriately protect individuals who have objections to abortion based on religion. The Federal Refusal Clause treats HMOs, health care insurers, and hospitals as individuals—and in doing so, places their preferences above those of patients. The Religious Coalition for Reproductive Choice agrees with House Minority Leader Nancy Pelosi (D-CA)—who said the provision is "a disgraceful display of ideology over health"—and with Senator Olympia Snowe (R-ME), who called the provision "an ill-advised policy that is clearly harmful to women." Senate Majority Leader Bill Frist (R-TN) has promised that he will schedule a vote next year on a bill sponsored by Senator Barbara Boxer (D-CA) that would repeal the abortion-related language. We promise to hold Frist to his promise. WASHINGTON (UMNS) - Young adults are encouraged to apply for a summer internship program with the United Methodist Board of Church and Society. Applicants for the Ethnic Young Adult Summer 2005 Internship Program must be between the ages of 18 and 22 and be of Asian, African American, Hispanic, Native American or Pacific Islander heritage, reflecting the denomination's five ethnic caucuses. The 11 young adults selected will have the opportunity to gain experience in public policy and be placed in governmental and nongovernmental offices, faith-based advocacy agencies and grass-roots organizations in Washington. Candidates must be active in their local churches and show leadership in faith-based social justice issues. They also must be willing to interpret - or tell about - the ministry of the Board of Church and Society after the internship. The denomination's Inter-Ethnic Strategy Development Group sponsors the program. The eight-week internship, from June 6 to Aug. 1, offers a $1,500 stipend. Round-trip airfare and accommodations in Washington are included. Feb. 1 is the application deadline. For applications, call Neal Christie at (202) 488-5611 or send an e-mail to [email protected]. Jim Wallis, editor of Sojourners Magazine, is scheduled to be a guest on NBC's Meet the Press this Sunday. Wallis, who was recently on the campus of Eden Theological Seminary, is one of America's leading progressive evangelical Christian voices. The topic: moral values in America. Tune in. Update: Read how the program turned out by clicking here. Most of my holiday shopping occurs on Christmas Eve. It has become a tradition. My gift buying normally reflects my values. I try and buy gifts from local artists, stores where unions help provide decent wages and good benefits, and markets that sell goods from outside the country that have been obtained at a fair price instead of at the hands of sweatshop labor. Eric Berg is a Portlander who I have known since my high school days (he might have already been in college). These days he is working with the Portland Jobs with Justice Faith - Labor Committee, a group associated with the national Interfaith Worker Justice (formerly known as the National Interfaith Committee for Worker Justice. Interfaith Worker Justice has published a holiday guidebook that contains a list of places you can feel good about buying from. I read through it today and found it very helpful. The four-page booklet can be downloaded by clicking here. They also have a great newsletter that you can read by clicking here. Their stories showcase efforts in cities across the nation to link religious groups to the concerns and needs of workers in the United States and beyond. And if the name Eric Berg rings a bell for you there might be a reason. This guy will do just about anything to bring attention to justice issues. Even tease the FBI. On Nov. 14th, Iran signed an agreement with Britain, France and Germany that it would stop developing uranium enrichment facilities. Just days after this agreement, and one day after International Atomic Energy Agency head Mohamed ElBaradei reported that "all the declared nuclear material in Iran has been accounted for," U.S. Secretary of State Colin Powell released information to the media alleging Iran of secret weapons facilities. At the same time Secretary Powell was meeting with the media, half-way across the globe, another press conference by the National Council for Resistance in Iran corroborated his claim. NCRI is an exiled group that not only shows up on the official list of terrorist organizations at the U.S. State Department, but has repeatedly made false assertions about the Iranian nuclear weapons program. Sound familiar? The lead-up to the war in Iraq followed a surprisingly similar contour. With Iraq, the United States also claimed to have secret information not available to U.N. weapons inspectors on weapons of mass destruction and was subsequently proven wrong. The nuclear threat posed by Iran may well be serious. In the new post-Iraq war world where possession of a nuclear weapon is the best deterrent to a pre-emptive strike by the United States, Iran's ongoing uranium enrichment program, ostensibly for power plants, is a tremendous concern. The government of Iran has already submitted to the International Atomic Energy Agency protocol and has opened up its facilities to international inspectors. The question remains whether the United States will choose to act pre-emptively and unilaterally again through war or follow diplomatic channels. Send a letter to your member of Congress asking for careful consideration and a fair hearing of the facts of the Iranian nuclear program. To send a fax or e-mail message click here. The United Church of Christ will launch our long awaited national "God is Still Speaking" advertising campaign on December 1. Over 2,000 UCC congregations (out of 6,000) signed up for special training sessions in advance of the campaign. More churches have already signed-up to take part in the second run of ads that will be seen during Lent. The spot is edgy and has an important theological message. Bouncers are seen in the ad deciding who gets into church and who gets excluded. The scene fades to the message "Jesus didn't turn anyone away and neither does the United Church of Christ." It's a great message that speaks volumes about who the United Church of Christ is. Coming at a time when most mainline Protestant groups have been losing ground to more conservative congregations, many of Rhode Island's Congregationalist (UCC) clergy see the commercials as a way of countering the perception that their time is over, and that those who feel alienated by more conservative church traditions have no choice but run and hide. "There are so many people who have felt excluded from religious institutions and from their own faith communities," said the Rev. David Proctor, interim minister at the United Church of Christ's Four Corners Community Chapel in Cumberland, where the membership has doubled in five years. "What we are saying to these people is that we are here to welcome you, with all of your questions, your hurts and pains." The Rev. Ira Williams, associate minister of the Rhode Island conference, said he and many clergy are confident that the $12-million "God is Still Speaking" campaign, starting with the $4-million investment in the bouncers commercial, will make the 1.8-million-member denomination better known. "They test-marketed the commercials in several localities including Springfield, Massachusetts; Harrisburg, Pennsylvania; Tampa Bay, Florida; and San Diego, and in those places there was a 27-percent increase in new people coming to church," Mr. Williams said. "There was one small, struggling church in Tampa. It was inundated with new visitors after the commercials started." You can bet that some conservative Christians will take issue with the UCC's campaign. No matter. Taking strong stands is always controversial and this campaign will be no different. What is important is that millions of people will hear a message that Christianity is inclusive and loving. Everyone is welcome at the table. God is still speaking. (New York, November 18, 2004)—Across the United States, hundreds of thousands of poor people have been denied access to public housing because they have criminal records, Human Rights Watch said in a report released today. They have been excluded for often minor and long-ago offenses that have no bearing on public safety, which is the goal of strict admission policies. Based on research across the country, the 101-page report “No Second Chance” is the first examination of “one strike” policies in public housing. Established to protect housing developments from potentially dangerous tenants, these policies automatically exclude applicants with certain criminal records. Unfortunately, the criteria for exclusion are needlessly overbroad and can exclude certain offenders for life—regardless of evidence of their rehabilitation. “Everyone deserves safe housing, but these policies yield more misery and desperation than public safety,” said Corinne Carey, researcher for Human Rights Watch's U.S. Program. Let’s hope this report does something to draw attention to this issue. In the 17 years I worked on issues of homelessness this was a problem we faced time and time again. Where do you find housing for people with criminal records? The best solution would be to integrate people back into society with supervision, job training, education, along with efforts to make the ex-offender feel like part of the community. All the public wants to pay for is expensive jails that are far out of their sight. Jails don’t help offenders become better people and they don’t create safer communities. Maybe we could enact zoning laws in upscale sections of town that make it illegal for anyone with a prior conviction to live there. George W. Bush lives in public housing and he was arrested once for drunk driving. Should he be allowed to live in the White House? Or do different rules apply to different classes and races? Visit the National Low Income Housing Coalition to learn more about America’s housing crisis. TWIRP ("The Woman Is Requested to Pay") Day is canceled in a small Texas school district, after a parent complained that the school Homecoming Week tradition of a "social-role reversal" encouraged cross-dressing and homosexuality. The Plano-based Liberty Legal Institute issued a press statement stating that it had come to the aid of "concerned parent," Delana Davies, who worried about such "experimentation" with cross dressing. Said Davies, "'If it's OK to dress like a girl today, then why is it not OK in the future?'" And what is the day been replaced with? A day where children show up in school wearing camouflage. Hasn't someone already made this into a movie? So, am I to understand that it is morally reprehensible for boys to dress like girls, but it is morally neutral for them to dress like killers? If this is the direction we're headed, excuse me while I go hunt (sans camos, tyvm) for a rock to crawl under. Father Jake Stops the World. A crucial Congressional bill addressing the genocide in Sudan is in risk of losing support. The measure calls for targeted sanctions against the leaders of Sudan and $200 million in humanitarian aid for Darfur and refugees in Chad. Separate and slightly different bills passed both houses prior to the election, but now the agreed upon final bill has to pass both houses. The Senate has said they will act as soon as the House has. We can’t let this issue get lost in the post election crunch. The result would be our nation turning our back on one of the human tragedies of our time. Now is the time for people of faith to act! Click here to send a letter to Congress. Related Post: Is It Ok That They're Dying Just Because They're Black People? I’m out sick today. So go over and visit WWP’s ever-cool blog. Link: worldwide pablo: ThURLSday reprise. Beliefnet.net wants your help in coming up with the winner of their 2004 Most Inspiring Person of the Year Award. Click here to nominate your choice. I’ve been thinking more about Tom DeLay and moral values. DeLay is the House Majority Leader who is about to be indicted for criminal behavior. Indicted members of Congress have been required to give up leadership positions. That changed yesterday when the Republicans altered their rules to allow indicted officials to keep their posts. Isn’t it ironic that DeLay is supposed to be the face of moral values in the House? The Republicans did everything they could to claim the mantle of moral values in the elections last month. I think they should be held to that high standard. After all, they asked for it. So did the evangelical Christian supporters of DeLay and other conservative republicans. As you know, Tom DeLay is a member of First Baptist Church of Sugar Land. I am a Christian concerned about moral values. This November, Mr. DeLay and the Republican Party ran as the champions of moral values. Unfortunately, Mr. DeLay has a record of unethical behavior that belies his support for moral values. Twice in the last year he has been admonished by the House Ethics Committee for his actions. A state court is set to indict Mr. DeLay for criminal behavior. Such an indictment should cost Mr. DeLay his position as Majority Leader. Yet the Republicans changed the rules to protect Mr. DeLay’s position. Now indicted criminals can hold positions of integrity in the US House. I’m sure that you will agree with me that this is unacceptable. As Mr. DeLay’s pastor you have a special responsibility to speak out on moral values in your community. I hope you will take this opportunity to encourage Mr. DeLay to resign his position in Congress. Non-partisan reform groups have called on the Congressman to resign and he has declined. Mr. DeLay has an opportunity to show his support for moral values by resigning his seat. I hope you will ask him to do so. Don't you think Dr. Rambo and other conservative evangelical Christians should speak out on this issue? Or is the cry for moral values just a campaign slogan. You can e-mail Dr. Rambo and ask him yourself by clicking here. I will have to admit that your website seems to be fairly effective. Within days of your article, I received several emails calling on me to speak with Tom DeLay. Most of the emails were copies of your email—some were a bit more personal. Having stated this, I must inform you that I am not Tom’s pastor. While I was quite fascinated with your ability to crank out emails, you should know that they are being sent to the wrong person. Tom has not been a member of my church for almost three years. He and his wife joined a church further into Houston which is public record. I still have a relationship with Tom and I believe in him because of the time I have spent with him, but we have not talked about these allegations. I am asking, strictly on a personal note, if you would inform your readers of this error so that my email would no longer be filled with their complaints and criticisms. I appreciate your attention in this matter. Dr. Rambo may no longer be Mr. DeLay's pastor but he remains a public supporter in his role as a Southern Baptist minister. This is what I wrote back to him. Scott, I will make the correction. I regret that anyone sent e-mails that "were a bit more personal." You would be amazed at the amount of e-mails I get from Southern Baptists and other evangelicals that are simply angry personal attacks. It is disheartening. I hope you found the tone of my letter more respectful. You have been, however, very publicly identified with Mr. DeLay. As his pastor (now former), you have lent him public support. I hope you take the opportunity to speak with him about these issues. Those who claim to speak for "moral values" need to be held accountable when their actions prove to be unethical. As a well respected Christian minister and friend to Mr. DeLay, you have a responsibility to bring these errors to his attention. If you are unwilling to raise these issues who will? I hope that Dr. Rambo shares all your e-mails with Mr. DeLay. Our point has been made and I think it is fair to honor Dr. Rambo's request that no further e-mails be sent. Texas Congressman Tom DeLay may soon be indicted by a state grand jury on political corruption charges. Some of Delay’s closest allies have already been charged. Rules in the US House of Representatives required that members of Congress in leadership positions must step down if they are indicted on criminal matters. Delay is the Republican Majority Leader. The rules were put in place when the Republicans took over Congress in 1995. Today the Republicans changed those rules to allow DeLay to keep his post even if indicted. The reason? Payback. Many Republican members of the House owe their jobs to DeLay who campaigned for them and raised enormous amounts of cash. "Each party has the right to set its own governing rules," Common Cause said in a statement, issued with Citizens for Responsibility and Ethics in Washington (CREW) and Campaign Money Watch. "But this change to reward Rep. DeLay for his tactics in using redistricting to create five new House seats for Republicans does nothing for the public good. In fact, it tells the public that Republicans' attitude, when it comes to ethics, is "Do as I say, not as I do." And it only serves to produce greater cynicism among citizens who see politicians concerned only with protecting their own." The groups noted the irony that 11 years ago, House Republicans adopted the same rule scrapped Wednesday in an effort to draw attention to Democrats' ethical problems. In fact, Rep. DeLay himself was a key player in calling for those tougher ethics standards. Common Cause for months has been shining the light on Rep. DeLay's unethical behavior, which has been bad enough to illicit multiple admonishments from the House Ethics Committee, which until recently has sat mostly dormant for seven years. Common Cause has called on Rep. Delay to step down as majority leader, since his ethical behavior makes him unfit to lead in Congress, and also teamed with CREW to call for an outside counsel to investigate ethics complaints filed against Rep. DeLay. Click here to visit the Common Cause web site and keep track of the corruption under way in Congress this week. Aren't these the guys elected to protect moral values? From Sweden to Kenya, churches should take responsibility for mobilizing locally and advocating for economic justice at their national government level. This was one of the main messages from a public seminar on "The role of the churches in fulfilling the Millennium Development Goals" taking place in New York City during a World Council of Churches (WCC) International Affairs and Advocacy Week at the United Nations. Based on a vision of justice and a radical change in economic ethics as the ultimate goal of church advocacy, the focus for the14-19 November Advocacy Week's first session was on the UN Millennium Development Goals (MDGs) as one step towards a more just society. The MDGs were agreed by the UN, and aim to reduce extreme poverty by 2015. Speakers at the seminar, representing a variety of WCC partners, agreed that the power to achieve the MDGs and debt cancellation lies with the national governments in the South as well as the North, and that churches should focus their advocacy work on these governments. Mobilizing at the grassroots, local, level on economic issues, and advocacy on good governance and anti-corruption campaigns at the national level, are important ways that churches can work towards more just economic systems, they suggested. "The hope of humanity is in the churches. Churches need to challenge the neoliberal policies of the World Bank and International Monetary Fund when they undermine the spirit of the Millennium Development Goals, and also need to keep national governments in the South accountable to rational and honest use of their national resources," said Polycarp Omolo Ochilo, director of international affairs, service and witness with the All Africa Council of Churches. Salil Shetty, the executive director of the UN MDGs Campaign, suggested that churches can be critically engaged in unifying and mobilizing people. He offered many positive examples of creative MDG campaigns across the globe, from Italy to Brazil, showing how mobilization of civil society can call attention to issues of poverty and call for government integrity and responsibility. Chien Yen Goh from the Third World Network highlighted the inequitable trade policies that make it very difficult to achieve the goal of "creating an international partnership for development". According to Goh, trade is a crucial part of global society, and trade policies should ideally serve the needs of development within a government’s overall policy. Current economic systems and patterns of liberalization critically weaken necessary structures and widen the gap between poor and wealthy countries. "It is impossible to meet the MDGs without 100% debt cancellation for the poorest countries," said Neil Watkins of the Jubilee USA network. Interest payments are crippling many countries, to the extent that Zambia is paying 20% of their national budget on debt interest and repayment, and only 3% of their budget on health care. This is happening while their country suffers from the HIV/AIDS pandemic, and life expectancy has gone from 50 years in 1980 to 38 today. Watkins also pointed out that there is no evidence that debt relief has contributed to corruption and increased military spending; he suggested that in fact, all the evidence shows that debt relief has freed funds for poverty reduction. Like many churches around the world, the Church of Sweden has been active in the Jubilee campaigns, and staff person Karin Lexén said that they "will continue to rally around the Millennium Development Goals as one tool for advocacy towards a more just economic system". 2005 will be a critical year for work on issues of economic justice. This year offers a new opportunity to put poverty and human rights back on the agenda and to show critical links with the current overarching security concerns. Discussions on 100% debt reduction are actually happening within many governments, and there will be a review of the MDGs as well as other major economic policies. Can Christians Be Pro-Choice? Yes. During the Kerry campaign I encountered a Roman Catholic seminarian protesting the senator's pro-choice position. That same seminarian posted a comment today on my site asking me to justify my position on abortion (which he termed murder) as a Christian. I responded by rejecting the premise of his question. Abortion is not murder and I feel no obligation to justify my Christianity to this seminarian or anyone else based on one single issue. My guess is that he is a faithful Christian and I demand the same respect regardless of any difference we might have on the issue of abortion. The official Roman Catholic position on abortion is also a faithful attempt to discern God's will on issues of life. Many churches, however, have come to a different conclusion than the Roman Catholic church that are just as faithful. Plenty of Christians are pro-choice. Click here to read the official pro-choice statements from denominations like the United Church of Christ, United Methodist Church, Episcopal Church, Presbyterian Church USA, American Baptist Church, and others. Dana Christensen is the seminarian who wrote me. He has a blog that he used to promote George W. Bush's campaign. Visit it and you'll quickly see a very different theology than the one promoted here. That's just fine. I suspect there are times we can learn from each other if we begin from a place of respect. No one - not even pro-choice advocates like myself - want abortions to occur. They should be safe, legal and rare. That makes Christensen's support of President Bush ironic. It turns out that abortions have actually increased under Bush's leadership. If you want less abortions we need to return to the social policies of the Clinton / Gore years. Keep in mind that not all Catholics voted just on the issue of abortion. The Catholic vote was nearly split. Many Catholic leaders also spoke out against those who demanded that Catholics vote on just this one issue. Those good folks deserve our respect and thanks. The majority of religious people in America are pro-choice. Don't be fooled by rhetoric that tells you otherwise. UPDATE: Here are some resources from the RCRC that might be helpful. As Christians, who strive to follow Jesus, we can and must be both compassionate and pro-choice. When we as Jews advocate for reproductive freedom, we are pursuing justice for women and seeking peace among the diverse religious communities of this country. Remarks delivered by Reverend Carlton W. Veazey, Pres. and CEO, Religious Coalition for Reproductive Choice, at the March for Women’s Lives in Washington, D.C., Sunday, April 25, 2004. By Reverend Barbara Gerlach, First Congregational United Church of Christ, Washington D.C.
For more information visit the Religious Coalition for Reproductive Choice. US troops have refused the Iraqi Red Crescent access to Fallujah. The city has been under assault for days and reports on the conditions within the city are grim. It is unknown how many civilians have been killed but the numbers will undoubtedly be high. Violence has broken out in several other Iraqi cities since US troops launched their recent offensive. The US-installed government in Iraq has declared marshal law as the situation in Iraq continues to deteriorate. Our government has a moral obligation to allow the Red Crescent and other relief agencies immediate access to Fallujah. Continued civilian causalities only further undermine our position in the region. Christians across the globe spoke out against the invasion of Iraq in part because they foresaw the human toll and chaos that was likely to ensue. Those concerns have turned out to be obviously valid. We must offer our prayers for the safety of the Iraqi people during this new wave of violence and for the safe return of US soldiers from a misguided and mishandled military campaign. These pictures were taken from Al Jazeera. US media is reluctant to show the human cost of war. That means we sometimes have to get our news from sources outside of our own country. The Republican National Convention gave Al Jazeera renewed creditability when they allowed the Arab media company to cover their convention. Speak from the Heart: Progressive Christian Voices has a news blog tracking religious stories of interest to progressive Christians. Take a look. Support Specter--Contact Your Senators Now! Less than a week after the election, the first battle over reproductive choice has begun. At stake is the chairmanship of the powerful Senate Judiciary Committee. Sen. Arlen Specter (R-PA), the only pro-choice Republican on the committee, was expected to head the committee next year. Now, thousands of anti-choice activists are protesting his appointment. Pro-choice people of faith need to make their voices heard, quickly and effectively. Specter set off a furor last week with an apparent warning to President Bush not to select Supreme Court nominees who oppose abortion rights. On Sunday, Specter clarified his statement. He said that he was merely recognizing the political fact that nominees who oppose abortion rights are likely to be defeated because the GOP does not have the 60 votes needed to break a Democratic filibuster. I am a person of faith and a values voter. Because of my faith, I support religious freedom and reproductive choice. Therefore, I strongly protest any effort to punish Senator Specter, or deny him the chair of a committee, because of his views. I am hoping and praying that you will not do so. Faith groups worked so well together during the campaign to energize people of faith, bring new people to the polls, and ensure that people would be allowed to vote. We must continue to build, and we need to act-quickly and effectively-at this time. It’s official—the UCC’s first-ever, television advertising campaign will debut nationwide on Dec. 1. That’s the word from the Rev. John H. Thomas, the UCC’s general minister and president, who made the definitive announcement Oct. 19 on the UCC’s website ucc.org during a live video "web-streaming," also the first of its kind for the denomination. "This is a very exciting time in the life of the United Church of Christ," Thomas told more than 1,500 viewers during the 15-minute online announcement. "Just this last weekend, our Executive Council authorized us to move forward in the airing of a commercial as part of our ‘God is Still Speaking’ campaign." The 30-second spot, produced at-cost by Gotham, Inc.—a major advertising firm in New York City—will air for 26 days on network and cable stations, explained Ron Buford, national coordinator of the UCC’s Still Speaking Initiative, speaking with Thomas in an interview format. "We will reach 60 percent of the population who will see the commercial four to five times," he said. The initial media buy will cost $1.5 million and will be funded by designated contributions from across the church. Although substantially smaller than the originally planned, $4-million, six-week launch, the out-of-the-gate effort is still ambitious, Thomas said, and hopefully it’s just the beginning. A second installment of ads—utilizing a different 30-second spot—is expected to air in February, during Lent, if UCC members and congregations come through with the necessary financial support. "Airing this commercial is not going to be free," Thomas said, while he and the Rev. Sara D. Smith, pastor of Kenilworth UCC near Buffalo, N.Y., made an online appeal for support. "This is something [the church is] doing together, because there are people who need to know that God is working in their lives," Smith said, indicating she’s made a personal contribution and has urged members of her church to do the same. Megan Hoelle, a member of Oregon’s Lake Oswego UCC and a young adult member of the Executive Council, says the campaign will help the UCC rebound from years of "stagnation and decline." "‘Still Speaking’ has really become a movement in the church, and it’s catching on," said Hoelle, an intern with the Still Speaking Initiative. The initial advertising spot—commonly referred to as the "bouncer ad"—attempts to drive home, in dramatic fashion, the feelings of alienation experienced by many non-churchgoers who say they have felt excluded or unwelcomed by institutional churches for a variety of reasons. In the ad, two burly "bouncers" stand outside a picturesque church and decide which would-be worshippers are allowed inside. The disturbing scene fades to black where, in silence, written words declare, "Jesus didn’t turn people away. Neither do we." A sudden shift in mood and music underscores images of friendly UCC members, while an announcer proclaims, "The United Church of Christ—No matter who you are, or where you are on life’s journey, you’re welcome here." More than 2,000 congregations have "opted in" to the initiative, Buford reported to the Executive Council, meaning they have made an intentional decision to be active in the campaign by attending and facilitating trainings designed to prepare them to welcome new visitors, provide better hospitality, claim the UCC identity and reach out more boldly. The opt-in churches represent a "diverse demographic and geographic spectrum," Buford told United Church News. Thirty-five percent are former Congregational Christian churches, 32 percent are former Evangelical and Reformed churches and 30 percent are "UCC originated," meaning they were formed after the UCC’s founding in 1957. Visit stillspeaking.com to learn more. Bill Scher over at The Liberal Oasis is thinking about the 2006 midterm elections and makes a case that Democrats might take back the House. Take a look. Joshua's awareness the magnitude of suffering in the world came through eight years of serious debate in high school and college. This gave him a chance to test different ideas in the areas of politics, environment, and religion. He is involved in many groups and agencies that promote peace and non-violence, but his tendency is to create new groups to address unmet need, like nationally organizing organic farmers. Serving the church, to transform people's hearts for peace, is how he plans to continue with his model for peace in the world. Timothy was chosen as a Peace Intern by the Christian Church Disciples of Christ. He was trained by the denomination in issues of racism, immigration, economic exploitation, global mission, and war and peace. He then traveled to several camps and conferences around the US and Canada keeping the passion for peace and justice alive for the youth in the Disciples of Christ. Lori was raised in a family of social activists, but came into her own when she participated in mission trips with her church youth group. Last year Lori lived in Swaziland ministering to young people and people with HIV/AIDS. This experience has changed her life once again as she met Jesus in the people of Swaziland. She plans to continue her ministry with those affected by HIV/AIDS after her graduation from Eden next year. Chuck served as the Director of Community Outreach at Portland's First United Meth odist Church. He is presently a student at Eden. He administers a widely read and admired social justice website that fosters an understanding of the theological reasons for moving politically regarding issues of peace and justice. 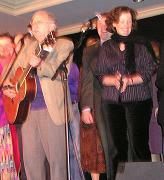 Peter Yarrow of Peter, Paul and Mary provided musical entertainment. He invited people to join him on stage to sing “Puff the Magic Dragon.” My wife Liz was up on the stage before you knew what happened. I quickly joined her and so did most of the other Eden students there. Peter also made a presentation on Operation Respect, a project designed to reduce violence in schools. For Liz and I getting up on stage with Peter was a wonderful once and a lifetime opportunity. We enjoyed every second of it. We're thinking of asking Peter to hit the road with us and the new band: Peter, Chuck & liz. One last personal note: It was great fun seeing The Rev. Cecil Prescod, a UCC minister from Oregon, and David Leslie, the executive director of Ecumencial Ministries of Oregon. Both attended the NCC conference over the last several days. Update: The Eden Theological Seminary web site has some additional pictures of the dinner. Click here to see. St. Louis, November 10, 2004 - The Rev. Dr. Michael Kinnamon, a St. Louis resident and Allen and Dottie Miller Professor of Mission, Peace and Ecumenical Studies at Eden Theological Seminary here, was presented with the Excellence in Unity Award during an awards banquet at the National Council of Churches USA’s General Assembly today. Called “one of the most active ecumenist in the world” by NCC President Bishop Thomas L. Hoyt, Jr., Dr. Kinnamon was given the award for his outstanding leadership in fostering relationships among denominations in which differences can be better understood and healing from brokenness can take place. 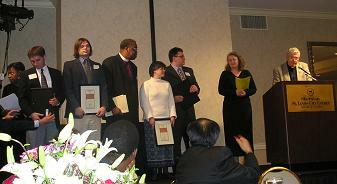 He is also recognized for his work to offer a strong prophetic voice to the Christian community, aid churches in discovering common theological ground that may contribute to the visible unity of the Church, and address church-dividing issues in order that the unity can be achieved and made visible in the world. Dr. Kinnamon is currently the Chair of the NCC’s Justice and Advocacy Commission, the newest commission in the Council’s structure. He has also served on the Faith and Order Commission where he chaired a landmark study on ecclesiology. In addition, Dr. Kinnamon has been active in the World Council of Churches’ Commission on Faith and Order and also played a pivotal role in the founding of the organization “Churches Uniting in Christ.” For this organization, he served as general secretary during the transitional period when it emerged from the Consultation on Church Union. An ordained minister of the Christian Church (Disciples of Christ), Dr. Kinnamon is a prolific author who has written numerous works about ecumenism including The Ecumenical Movement: An Anthology of Key Texts and Voices, which is widely used as a textbook on church unity. Protestant, Catholic, Jewish, and Unitarian Universalist leaders agree with the growing consensus that the presidential election was decided by issues such as war, terrorism and jobs, not unspecified “moral values.” Spurred in part by dislike of the divisive election, the religious progressive movement is being renewed. Religious leaders affiliated with the Religious Coalition for Reproductive Choice gave a news briefing at the National Press Club in Washington DC. They concurred that questionable interpretations of exit poll results are misleading the nation. No views or values changed because of the election. On one of the supposed hot-button issues, abortion, the percent of Americans in both parties who support reproductive choice in some or most cases remained steady. “For Catholics, polling has consistently shown that in the majority they want abortion to remain legal, gay Americans to have civil rights, and traditional liberal support for the poor and unemployed to be honored,” Catholics for a Free Choice President Frances Kissling said. “While there is much work progressive people of faith need to do to speak more compellingly to the general public, a solid foundation of social justice will work to mobilize mainstream Catholics." An unprecedented number of religious institutions were involved in voter education and registration, including the ecumenical initiative termed Faithful Democracy. Reverend Meg Riley, director of the Unitarian Universalist Advocacy and Witness Program, said that her denomination registered approximately 50,000 voters and built new relationships with other progressive organizations. She likened the 2004 election cycle to the beginning of a period of growth toward greater justice. The moral issues that concerned most religious Americans were poverty, war, families and children, healthcare, hunger, pollution, and human rights. “We face not a clash between cultures or between red and blue states but a clash between justice and greed,” said Jim Winkler, General Secretary of the General Board of Church and Society of the United Methodist Church, President George W. Bush’s denomination. Throughout the nation, progressive people of faith and religions are rallying to positive actions. In California, said Rabbi Steven B. Jacobs of Temple Kol Tikvah in Woodland Hills, the $3 billion stem cell research initiative is a clear indication that Americans do not want ideology to limit their healthcare. Reproductive choice is central to that vision and "consistent with democratic values,” concluded Reverend Lloyd H. Steffen of Lehigh University. He challenged progressive religious leaders and scholars to help the nation understand and reject "the dangerous movement to suppress freedom” being waged by those who oppose fundamental values such as reproductive choice. If you’re a progressive Baptist and feeling out of place there is a home for you. The Baptist Peace Fellowship of North America is a group that “gathers, equips and mobilizes Baptists to build a culture of peace rooted in justice.” The world needs more folks like these. They’ll be holding their annual conference in McMinnville, Oregon on the campus of Linfield College on August 1 -6, 2005. My step-father, Dr. John Thomas, happens to teach at Linfield. Marcus Borg will be the keynote speaker at their conference. WASHINGTON, DC- Today the National Coalition for the Homeless (NCH) releases Illegal to be Homeless: The Criminalization of Homelessness in the United States, the most comprehensive study of homeless civil rights violations. This study is also the most up-to-date survey of current laws that criminalize homeless people and ranks the top "meanest" cities and states in the country. This report examines legislated ordinances and statutes, as well as law enforcement and community practices since August of 2003. The National Homeless Civil Rights Organizing Project (NHCROP) — an effort of NCH, comprised of local advocates in communities across the country — has compiled quantitative and qualitative data samplings from 179 communities in 48 states, Puerto Rico, and the District of Columbia. These cities and towns represent rural, urban and suburban areas of all geographic and demographic varieties across the United States. This 2004 report finds Little Rock (AR), Atlanta (GA), Cincinnati (OH), Las Vegas (NV), and Gainesville (FL) to be the top five "meanest" cities in the United States for poor and homeless people. California is the "meanest" state, followed by Florida, Hawaii and Texas. Many of these communities have significant histories of violating the civil rights of homeless people and can be considered "repeat offenders." Just a few minutes ago I returned from a late night meeting of the National Council of Churches General Assembly where The Rev. Paul Sherry reported on the Let Justice Roll Campaign. The campaign is a joint effort of NCC and the Center for Community Change designed to challenge political leaders to address poverty issues. During the election season rallies where held (mostly in churches) in 13 cities across the United States (including Portland) to register voters and organize religious people who will carry on the campaign now that the election is over. Around 100,000 new voters were registered as part of the effort. Sherry, who is a former president of the United Church of Christ, will be convening the group at a December meeting to discuss next steps. One issue already on their agenda is working with bi-partisan leaders in Congress to raise the minimum wage. Sherry also plans to help establish a group of seminarians to take leadership roles with the campaign. One interesting side note: A young fellow was at the meeting with press credentials representing the Institute on Religion and Democracy (IRD). This is the organization that recently released a report charging that NCC’s advocacy work is anti-Semitic. IRD is funded by some of the very same people who have bankrolled George W. Bush’s campaigns and other republican efforts. Their representative at this meeting wanted to know why republicans had not played a more visible role in the Let Justice Roll Campaign. Sherry responded by explaining how NCC engaged in efforts to involve republicans but that no national republican leaders – including the President – would agree to take part in any poverty focused events. I then asked the IRD representative if he might use his organization’s close ties with Republican Party operatives to get them involved with our mission of reducing poverty. He didn’t utter another word after being asked that question. Bringing people together and reducing poverty are clearly not part of IRD’s mission. Doing that type of work would interfere with their efforts to foster division among church bodies. You should fully expect for more attacks on the NCC to be coming from the IRD. Just keep in mind where their funding comes from and what their mission really is. A group of Colorado high school students made a patriotic statement this past week when they held a protest to draw attention to their concerns over the direction of the country. BOULDER, Colo. (News 4) At least 85 students worried about war, a return of the draft and the future of the environment staged an overnight protest in the Boulder High School library before leaving peacefully Friday morning. The students said they wanted assurances from political leaders about the direction of the country. Rep. Mark Udall, D-Colo., met with some of the students for about an hour after they left the library at 7 a.m.
"We're worried that in four years we're going to be at war with five countries and we're going to have no trees," senior Cameron Ely-Murdock said. The rest of us could learn something from these young people. Our country is headed in the wrong direction. Our elections settled nothing and gave no politician of either party any kind of mandate. Those of us in the progressive movement need to keep issues of peace and justice at the forefront of the national agenda. May God bless these students for reminding us of our obligations as citizens. Alice Smith, my mother-in-law, is a Bay Area attorney with extensive experience working in Democratic Party politics. During the election last week she was sent to New Mexico to monitor the vote. She is already thinking about the next election. Click here to visit Alice's blog and read her thoughts about getting ready for the mid-term elections. My friend Zaher Wahab was profiled (again) in The Oregonian today. Zaher is a professor at the graduate school of education at Lewis and Clark College. Liz was actually one of his students when she got her masters degree. Over the last few years he has made repeated trips back to his home in Afghanistan to help rebuild that nation’s education system. He left Afghanistan to obtain his bachelors at Beirut University and later earned a PhD from Stanford University. This well educated man lives in the same building as my friends Alan Bogner and Mollie Copeland. Both Mollie and Alan worked with me at Portland’s Goose Hollow Family Shelter. Zaher offered to be our shelter custodian. For several years he would arrive each morning (by 6am) to clean-up the shelter before going home to change and head-off to Lewis and Clark to teach. He sent his meager wages from the job back to Afghanistan to help his family, buy school books for children, and even to build a well. We became good friends during his time at the shelter. For many Oregonians he became the face of Afghanistan after 9/11. His public presentations on that nation drew hundreds of people nearly everywhere he went. Zaher was a vocal opponent of the bombing campaign and the later war in Iraq. Zaher Wahab is an amazing man. This picture is of Zaher and our daughter Katherine during our trip back to Portland in late-August and early September. He'll be giving a free talk at Lewis and Clark on December 7th for those in the area. The Rev. Bob Edgar, general-secretary of the National Council of Churches (NCC), preached in the chapel at Eden Theological Seminary this morning. Edgar is in St. Louis for the 2004 NCC General Assembly. He offered some reflections on the recent elections and noted how important it was for progressive Christians to continue lifting up issues of justice to those in power – both Republicans and Democrats. Edgar also said that NCC plans to expand their advocacy efforts and told me before the service how important a roll he thinks FaithfulAmerica.org, NCC’s online advocacy service, will play in that expansion. Click here to read my June interview with Edgar for additional information. A couple of sites have been brought to my attention in recent weeks that I wanted to pass along to you the reader. Markham's Behavioral Health is a great site for hearing about how people deal with the stress of our current political climate. Make sure you visit. The Abundancetrek Blog is a great peace and justice site written by a man with a Presbyterian background. Distance is the outgrowth of another political blog. The writer is searching for ideas on how to build-up the progressive movement. I've got links to all these site - and more - on the left hand column of this blog. Go visit these good folks, say hello, and thank them for their efforts. The National Council of Churches kicks-off their annual General Assembly today here in St. Louis. My original plan was to attend most of the sessions. Unfortunately, babies and studies this week have to take priority. I do still plan on attending some of the events and blogging about them. A worship service for the assembly will be held on Monday morning at the Eden campus with The Rev. Bob Edgar, general-secretary of NCC, preaching. A late-night gathering will held on Tuesday to report on the results of the Let Justice Roll campaign. The Rev. Paul Sherry, former president of the United Church of Christ, headed-up that effort and will be the presenter. Eden's own Michael Kinnamon will be receiving NCC's Unity Award on Wednesday and I'd like to be there for that. The Assembly Peace Dinner is one of the final events on Thursday and I'm hoping to attend. Peter Yarrow (from Peter, Paul and Mary) will entertain and is even holding a jam session afterwards. Time to break out my drum. Keep watching this space for updates. First Congregational United Church of Christ of Portland, Oregon (my home church) now has a web site up. Check it out. FCC is a downtown Portland landmark with a long and rich tradition of preaching the Gospel and speaking out on social justice issues. The Rev. Dr. Patricia Ross is the senior minister and The Rev. Paul Davis serves as their minister of congregational life. Sunday services are held at 10:25 am. Like everyone else I’ve been trying to make sense out of the election results. What do the numbers mean? Why did Kerry loose? Do secular Democrats really want to keep us Christians in the closet? I’ve received hundreds and hundreds of e-mails announcing my near imminent departure for hell because of my pro-choice and pro-gay views. Am I really going to hell? If I get to pick someone to tag along can I pick George W. Bush? Does he already know the way? When left with questions like these at times like this it is best to turn to religious bloggers. Secular bloggers don’t count because many of you only want my voice at the table if I leave my Bible at home and promise never to mention Jesus unless used as a term expressing frustration. “Jesus! I lost my pen.” So I'm not playing with my secular friends today. So what do the progressive faith blogs have to say. Karl Rove did it. He was able to coble together a slight majority in this country by appeals to the base and in this particular election one of the most important components of that base was the evangelical protestant community. I don't have any criticism of Kerry and the moblization of the left in this country was the most impressive I've ever seen. That's probably why I had some level of optimism going into this election. But the problem is that evangelical protestants are so large a voting block that surmounting it in a national election is going to be an a daunting task for democrats in many states. I'm making an effort to look towards the future, and try to see where we go from here. The only conclusion I've come to so far is that progressives are failing to communicate their message. Once we've learned how to do this more effectively, we are going to have to engage those with whom we disagree in conversation. Personally, I'm not there yet. I can't talk to Republicans or Roman Catholics right now. I won't be going to ministerial association meetings, which are dominated by evangelicals, for awhile. Not only does their glee in electing a "good, God-fearing man" make me sick, most likely I'd give them a piece of my mind, and that is not the kind of conversation that's going to help right now. I do think he would have been a very good president. For all the slander he had to confront, he articulated a plan, fought the good fight, and organized the base. That he has chosen not to challenge Bush demonstrates class. He'll have some money in the bank, and let the country focus on issues. And now that Bush has won legitimately perhaps the liberal vitriol will cool down a bit. Progressives can now focus on framing the message: of sharing prosperity, building up strong communities, caring for the health and education of children, protecting the environment, and strengthening our borders. There will be plenty of times challenge the administration in its more egregious abuses of the political process. Later, in a few years, Kerry might lead an investigation of Diebold. Little Uptown never wakes or cries in the night. But at five this morning she was wailing and sobbing. "She knows," Mrs. Uptown said. So we took her from her crib, and, against house rules, brought her to our bed, and hugged her, and soothed her, until she slept. We surely weren't the only parents clutching their kids. A mother writes on a blogger's message board: "Last night I was so upset I crawled into bed with my little boy so I could sniff his sweet head and feel as if there were some good, true things in the world." You would think that something more than an election was lost, wouldn't you? There's a lot to say on a day like this. Everyone on the losing side has an opinion, criticism or psychic wound to share--and I do too. But let's not rush through the grief too quickly. Sick animals, Thich Nhat Hanh reminds us, curl up in the woods and go to sleep, so their bodies can heal without stress. Let's be just as smart as a muskat. Let's do the decent thing for our mental and physical health--scream and wail, rend our garments, gulp vegetable soup and bourbon, and take to our beds. Why such grief? Because dreams died hard yesterday. Some had names: the youth vote (kids stayed home), the women's vote (mothers must really believe their daughters will never need abortions), the black vote (huge, but sorry--you're just a minority), the lives of our soldiers (no price is too high to pay for Halliburton profits). Some were more abstract: the sanctity of the Constitution, leadership in science and medicine, environmental protection, health care for the poor, fact-based education, rights of gay partners, and more. Those who are weeping today--and if I know ten, then there have to be tens of thousands--are people with hearts and imaginations big enough to weep for our fellow citizens, our country and our planet. Sound overwrought? I think not. Because this was more than an election. Christians know a lot about losing. We know that to get to Easter we first have to confront the horror of Good Friday. Maybe Tuesday was another Good Friday. Maybe something wonderful is about to be reborn from the wreckage of Election Day. God did not abandon those who fought for justice this week. The people and their Pharaoh abandoned God. There will be natural consequences for that betrayal. Pray for mercy and justice. Pray that God guides us safely out of this darkness and into a place where we can once again partner with God to build a more just world. That's just what I'm thinking. What about you? Ms. Bernice Powell Jackson is Executive Minister of Justice and Witness Ministries, responsible for the church's work on human rights and social, racial and economic justice. Before her election, she was head of the UCC Commission for Racial Justice. Prior experience includes directing a scholarship fund for former South African Archbishop Desmond Tutu. Her undergraduate studies were at Wilson College, Chambersburg, Penn. She also holds master's degrees from Columbia University and Union Theological Seminary, N.Y. Bernice, an African American, is a member of Mount Zion Congregational UCC in Cleveland, Ohio. Her program within the UCC is where social justice work is centered in our denomination. Justice and Witness Ministries works on issues ranging from farm worker rights to stem cell research. Some of the most innovative Christian activism comes directly from her office. That means that her work is also a lightening rod for criticism from some of the more conservative and reactionary voices in the Christian faith (both inside and outside the UCC). Visit the UCC Justice and Witness Ministries web site to learn more about this important program of the United Church of Christ. Is It Ok That They’re Dying Because They’re Just Black People? Genocide should be one of those issues being covered 24/7 in the media. Churches should be praying about it every Sunday and organizing relief efforts. Our politicians should be reaching a bi-partisan consensus to rally the world to intervene. Instead we ignore the genocide taking place in Darfur. What if these were white Christians being slaughtered in Europe? Would our response be different? I’d bet money it would. This is just a sample of the chaos taking place. Click here for more news. The Save Darfur Coalition has ideas on how individuals can help on their web site. Make sure you visit. You’ll learn how one person might really make a difference in drawing attention to this crisis.